Getting out of bed at 5.30am to attend a breakfast one hour’s drive away in the City isn’t my idea of a great morning. I’m not a morning person at the best of times. But yesterday I did just that and was rewarded with a morning I’ll never forget. I’ll be the first to admit that – at times – I have struggled with bitterness. For a while there, after my diagnosis and again after I spent time in a psychiatric hospital after the birth of my first baby, I felt let down by my own body and angry at my ill-treatment at the hands of medical staff. Which is why I found the speaker for this year’s Melbourne Prayer Breakfast, Lindy Chamberlain-Creighton, so gripping. If anyone has a reason to be bitter, it’s Lindy Chamberlain (as she’s commonly known). 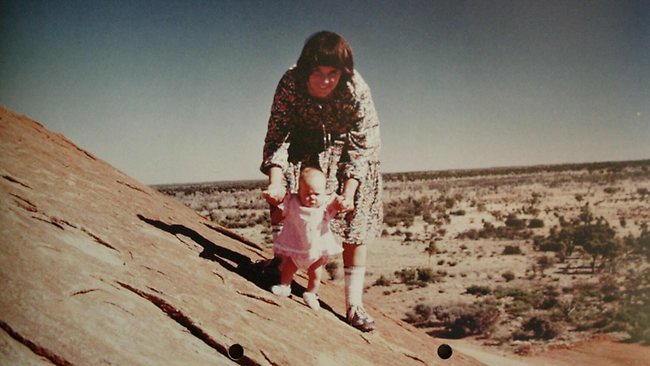 Accused and convicted of murdering her nine-week-old baby daughter Azaria (pictured above with her) while camping at Uluru – then known as Ayers Rock – in 1980, Lindy maintained that she saw a dingo leave the tent where Azaria was sleeping. After serving three years in prison with hard labour, Lindy’s conviction was overturned after the discovery of new evidence, and she was acquitted of all charges. Standing up on the stage, in front of 1000 people, Lindy looked more like someone’s friendly mother-in-law than someone who had been to hell and back. She started her speech by saying that she wasn’t going to talk about Azaria – or the dingo: “What happened to me is not as important as what I learned from what happened to me,” she explained. Sitting there, listening to this woman talk about being forced to clean toilet blocks with a toothbrush, and being hated by her fellow prisoners, I couldn’t help but feel anything but deep empathy for her. Prison didn’t sound to dissimilar from the high-dependency unit of a public psychiatric ward. And yet, Lindy’s message was one of hope. She challenged me (and I’m guessing everyone else in the room) to not let tragedy, or illness, or circumstances in life prevent us from living life to our full potential. I walked away from that breakfast feeling inspired. If Lindy Chamberlain can go through what she did and not be a bitter woman, then I’m going to try and follow in her footsteps. Yes, I have bipolar disorder. Yes, that makes life more difficult than if I didn’t have it. But what I have learned through this illness is valuable – both to me and to others. Those of us who have endured hardship and suffering can be “wounded healers” – sharing our own journey with others – to encourage them in their own struggles. If we allow bitterness consume us, to corrode our self-confidence and steal our joy – then we lose the opportunity to turn a bad situation into something good. Have you found that your experience of mental illness has enabled you to reach out to others in similar circumstances? Has helping others helped you? Would love to hear your comments below. Posted on October 19, 2014 by mariskameldrum •	This entry was posted in Anger, Daily Life, Despair and tagged Anxiety, Australia, bipolar disorder, bipolar moms, bipolar mum, bitterness, Health, lindy chamberlain, mood disorders, motherhood, psychiatric ward. Bookmark the permalink.